My cellphone collection from old to new! Technology is growing so fast you have to keep up with the latest trends. Today as cleaning my room cupboards I found my old sony ericsson phone. I remember I kept it because It was my first colour screen phone. My phone was a sony ericsson t610. The features it had was java, internet and the camera. The camera was crap but not back then. The phone didn’t have operating systems like android or windows 8 like we have in today’s phones. The phone was pretty basic for a latest phone at the time. I took a photo of all the phones I had, as you can see in the picture above you. 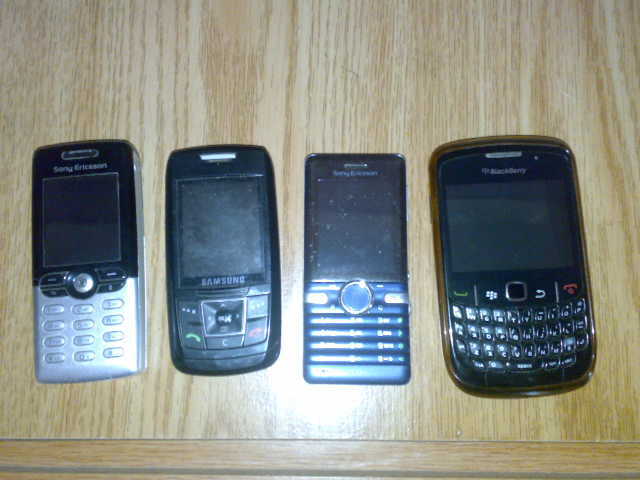 I couldn’t find all my phones that I had but if I can remember correctly, all the phones I had was first a nokia 3410, second my sony ericsson t610, third a Motorola L7, fourth was a samsung can’t remember the model, fifth is a sony ericsson s312 and lastly my blackberry curve 8520. The cap between my first and latest phone is about nine or ten years now. I can’t even imagine what cellphone’s will be like in about ten years from now. Now days we got ipads, blackberry playbooks and android tablets which is the latest and best of the portable technology. Before cellphone was for calling people but no one does that much these days, because of instant messengers. My next phone most likely will be between the samsung galaxy S3 or the nokia lumia.